I belong to a whisky club. Now, prejudicial creatures as we humans are, the reader of such an assertation might well presume that I am an older aged, white of hair English gentleman, probably from a wealthy background, whose proclivities for the finer things in life have resulted in the onset of gout and a rather rotund posterior. My aforementioned club will no doubt be furnished with dusty Chesterfields, taxidermy and antiques, and will be stocked with single malts beyond the financial dreams of the lowly peasants on the other side of the front door. Sitting atop of The Vintage House on Old Compton Street – a family business that has been going strong since the 1940s – Soho Whisky Club is the brainchild of the shop’s owner and General Manager, Malcolm Mullin. The venue opened its doors in November 2011 with 300 whiskies on offer and a mission to create a relaxed environment in which people could get away from the hustle and bustle of central London, to enjoy a decent dram of single malt scotch. Just over five years later, they now have over 700 bottles to choose from and a reputation as the least pretentious private members’ club in London. The entrance to Soho Whisky Club is an unobtrusive wooden door to the left of the shop, and a handwritten label next to a buzzer system is the only visible signage that this is not in fact someone’s home. The doorway opens up onto a slim corridor with stairs at the end that lead up to the bar. Decked out with pretty uninspiring square tables and basic chairs, this isn’t exactly a space that reeks of splendour. However, this – we would argue – is the very beauty of the club. 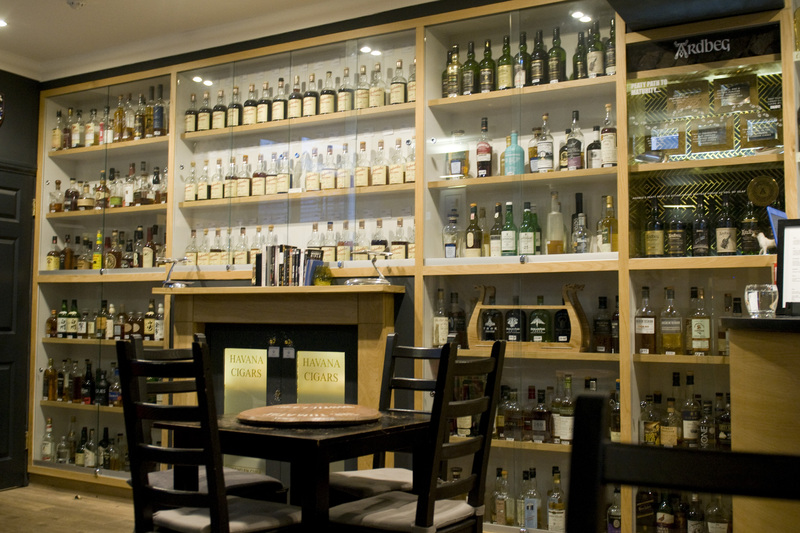 There is no pomp and circumstance, no catering to egos; this is a whisky club, quite simply, for those who love whisky, and the evidence for this lines the walls, peeking out from their bottles and begging you to pick them. Once you’ve managed to stop yourself from ogling the display, the gravitation towards the bar is inevitable, behind which are carefully selected favourites, arranged by price and available by the dram. Despite being a private members’ club, prices start from £3.95 and there is somewhere in the region of 170 whiskies for under £5 a dram. Of course, there is also a large collection of astonishingly rare and expensive bottles, one of which costs £999.99 a dram (because that extra penny matters)! Special offerings are showcased on the bar itself and the stupendously friendly and knowledgeable staff are more than happy to offer recommendations and suggestions based on your taste, mood or budget. As well as offering an extensive range of whiskies from all across the globe, members can enjoy Habanos cigars on the cosy outside terrace, which has been fitted out with heaters and an array of blankets to stave off the winter chills. Soho Whisky Club is definitely to be recommended for its laidback atmosphere, fantastic choice and wonderful staff, however, the tastings are the true lure. Every couple of weeks, the powers that be bring in a “Whisky God(dess)” to run free tastings for members. These evenings give participants the opportunity to try six or seven drams either from a particular distillery or a range of distilleries owned or bottled by a single company. The Ambassador talks about the company, their specific process of distilling, and then leads guests through the sampling. Tasting notes are shouted out by all and “there are no wrong answers”, making the nights fantastically interactive, educationally boozy and most importantly, great fun. 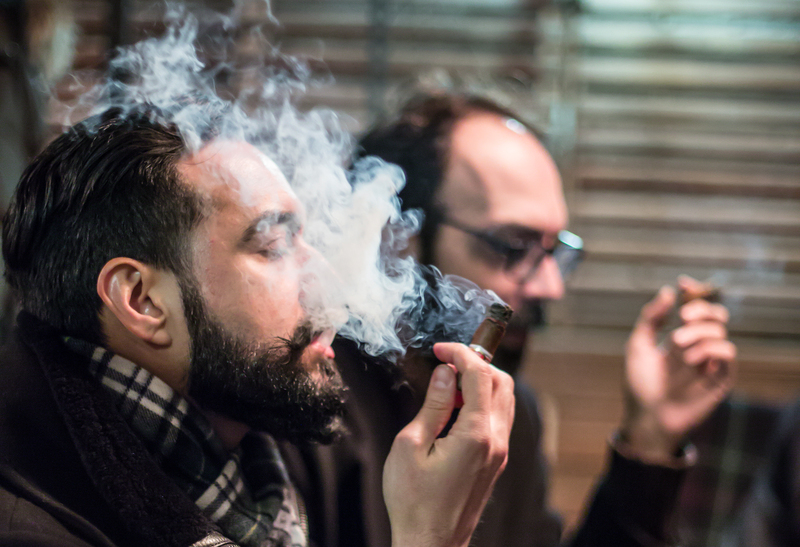 Monthly cigar tastings are also offered to members and consist of one or two cigars paired with different tipples, be they sherry, port, calvados, Armagnac, cognac, wine, gin, tequila or, of course, whisky. For these events, there is an ambassador present from both the drinks supplier and the cigar company to talk about their respective products. 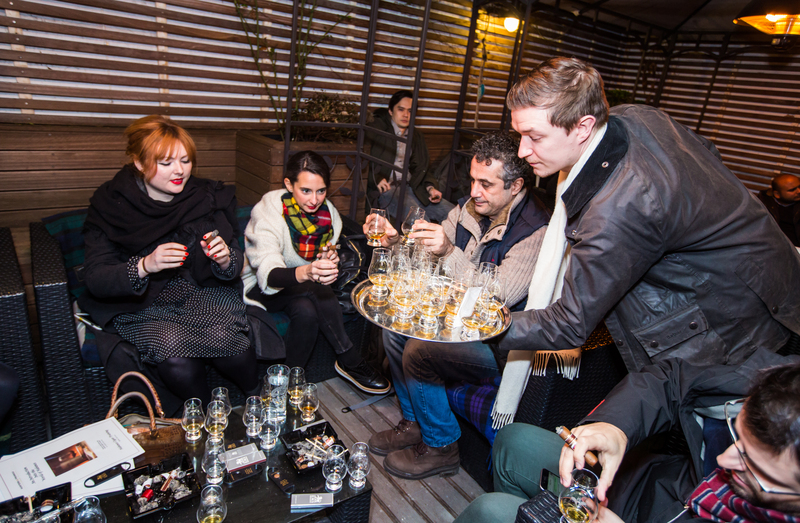 Soho Whisky Club is the perfect venue for both aficionados and excited newcomers to the wonders of the Water of Life. For more information of the club and how to join, visit their site, or pop on down to The Vintage House and ask Malcolm if you can have a gander. 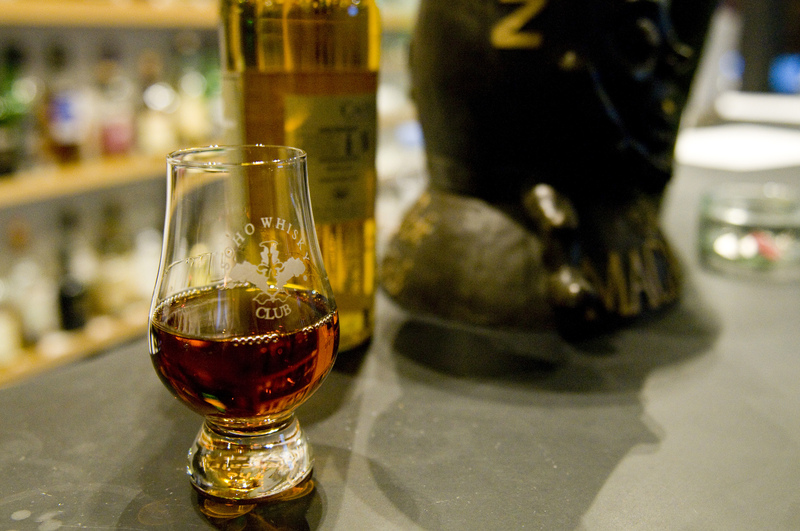 Read our interview with Soho Whisky Club’s General Manager, George Keeble, here.